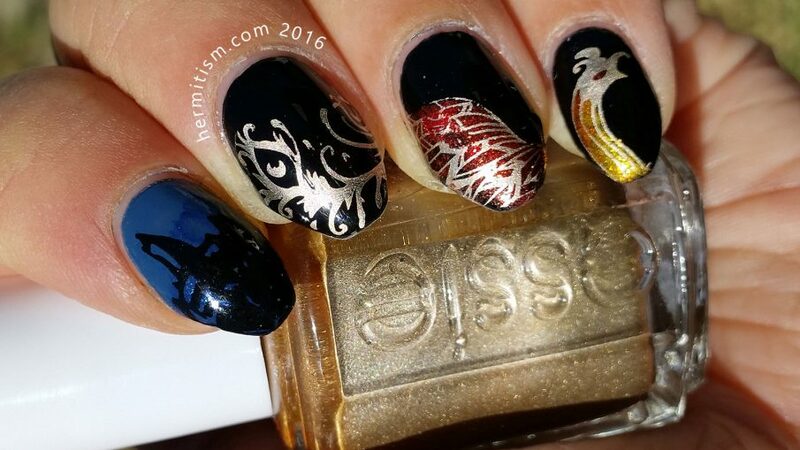 Nail Polish Society started a weekly alphabet challenge for nail artists several weeks back. I have actually been participating from the start, but laziness kept me from setting up a blog and posting them so I could join in on the InLinkz. Tonight I have conquered laziness! But I should be going to bed soon so let’s keep this brief (aka I’ll edit this post and list the nail polishes and stamping plates I used later (for possible values of always tomorrow)). This challenge’s letter is ‘H’ and I picked Harry Potter and doubled down with a focus on Hogwarts. And, since I have a thing for feather patterns and fiery reds, I focused on Fawkes as a prominent symbol of Hogwarts. As you can see I have an addiction to reverse nail stamping. It is a time-consuming sickness. For the first time I used a paint brush instead of a dotting tool to color in the decal. It helped prevent me from accidentally picking up and destroying the lines of the stamp so I will probably be doing that more from now on. Originally I had some sort of wall pattern behind the Hogwart’s crest but it was too low-contrast and made my thumb look busy so I went back and painted over it with black. 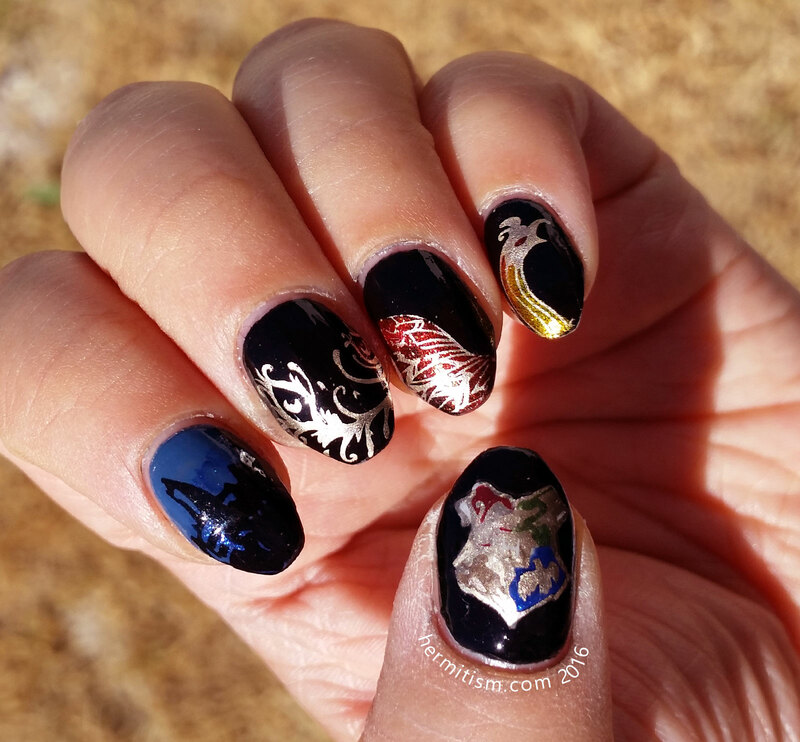 I also painted over the back of the decal with white before applying the Hogwart’s crest to my nail to make sure all the colors would pop and not get dulled down by the polish beneath it. My right hand. 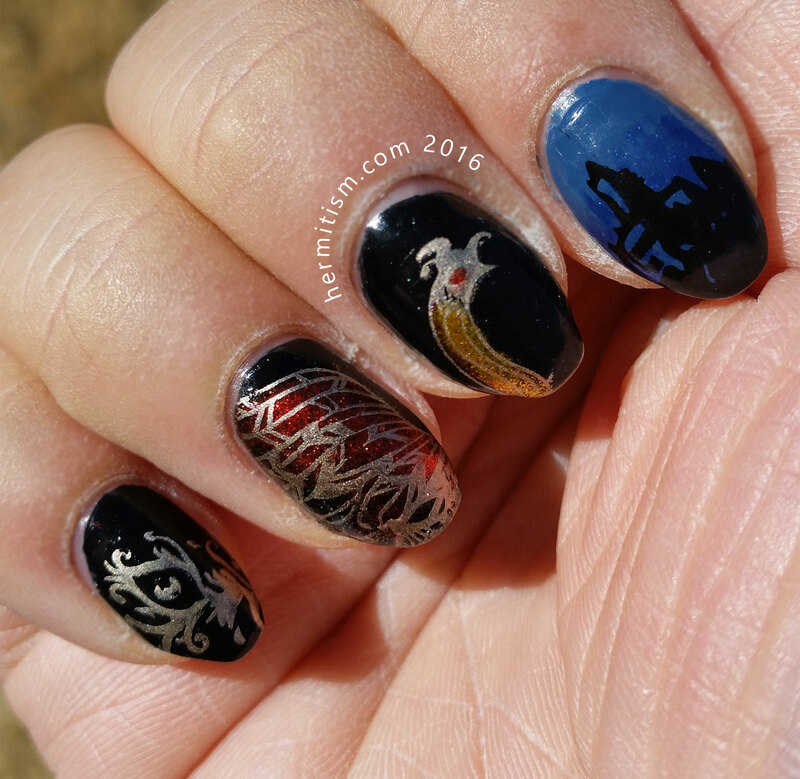 I reversed the order of Fawkes the phoenix’s head/wing/tail feather because I was too lazy to stamp it down on some clear polish and reverse reverse nail stamp it. Is that a thing? Either way I think I prefer this hand, which usually doesn’t happen.